Base of Emmy Rossum’s hairstyle is good, old milkmaid braid. Chic statement of..
Base of Emmy Rossum’s hairstyle is good, old milkmaid braid. Chic statement of this style is hair crimping before creating the big braid over the crown. Hair crimping is life savior if your hair is thin and lacking volume. Depending on your preference, when repeating this style you can opt for both middle and center parting of your bangs. Leave a few wisps loose on the sides to soften the look. Emmy Rossum arrived at Real Simple’s Botanical Beauty party in New York look..
Emmy Rossum arrived at Real Simple’s Botanical Beauty party in New York looking fabulous and very Bardotified! The front and crown are both heightened while the sides are flipped back and the rest left loose with just a tinge of meek waves. You like? Emmy Rossum’s naturally-curly hair is relaxed into a wavy, loose, romantic hairs..
Emmy Rossum’s naturally-curly hair is relaxed into a wavy, loose, romantic hairstyle. This look is perfect for women of all ages. Emmy Rossum’s long, brown hair is styled in a very curly, voluminous hairstyle. Emmy wore this look to the 11th Annual Critics Choice Awards held in Santa Monica, CA in 2006. Emmy Rossum’s braided chignon bridal hairdo is very elegant. Hair was parted in..
Emmy Rossum’s braided chignon bridal hairdo is very elegant. Hair was parted in the middle and braided at the nape of the neck and fashioned into a bun. A sparkly tiara was added to finish off this romantic updo. Emmy Rossum’s curly, brown hair is styled in a romantic updo. Emmy wore this..
Emmy Rossum’s curly, brown hair is styled in a romantic updo. Emmy wore this hairdo to the Fashion Group International’s 26th Annual Night of Stars. 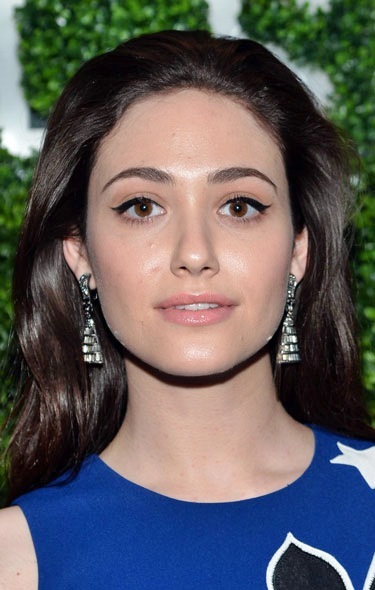 Emmy Rossum’s long brown straight hair is styled in a standard braid. The end is..
Emmy Rossum’s long brown straight hair is styled in a standard braid. The end is over one shoulder. Her bangs are secured to the side with bobby pins.